Feast on Chinese soul food this New Lunar Year at Chynna! 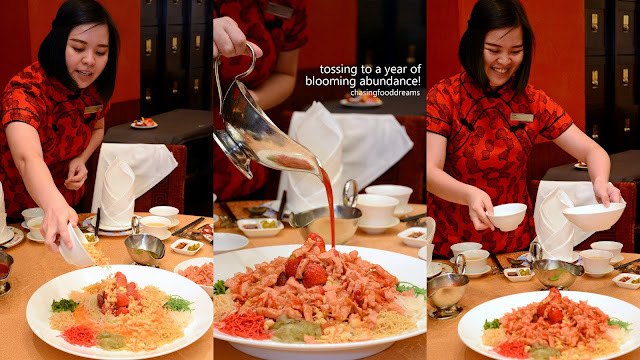 Hilton Kuala Lumpur is wishing all their guests a Year of Blooming Abundance and there is not better wish to start the year than a festive CNY menu at the fine dining Chynna. Executive Chef Lam Hock Hin and the culinary team is bringing back soul food to take diners back to a gastronomy trip down memory lane. Chynna has been serving fine Cantonese cuisine set in a Tang style opulent ambiance. Vibrant bold red, gold and dark wood Oriental theme, Chynna features an extensive menu of eclectic mix of Cantonese and Shanghainese cuisine. The dining experience includes a tea master that acrobatically pours the house signature 8-Treasure Welcome Tea through a metre-long spout gold kettle that will leave diners in gleeful notes. 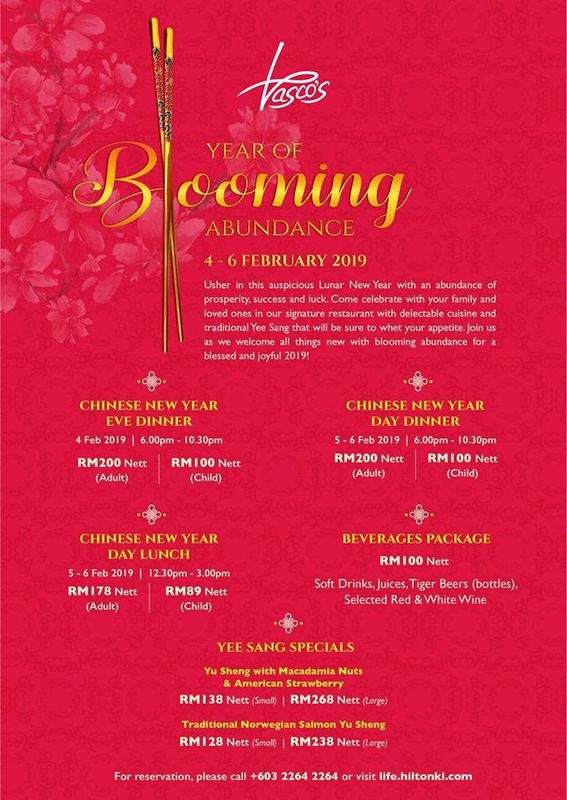 This festive Chinese New Year, Chef Lam has curated 4 special festive set menus along with a list of a la cartes and Yee Sangs. The 4 festive menus include Abundance, Prosperity, Wealth and Grand Fortune that starts from RM288nett per person to RM688nett per person. Injecting a little fun of the West, this year’s highlight from the Yee Sang list is the Yu Sheng with Macadamia Nuts and American Strawberry. For those who do not eat raw fish or simply prefer non-seafood, this Yee Sang hits all the right notes. The burst of fresh and juicy tang of strawberries brought Yee Sang to a new level of lusciousness. So delicious, the usual slices of raw fish was not overly missed. Instead of the usual peanuts, premium macadamia nuts made an appearance here. The sauce, a fruity one as well, married everything else in harmonious flavours. Simply delicious! For the soup course, the Braised Assorted Dried Seafood with Vegetarian Fins, Crab Meat and Fish Maw was sublime. The thick soup exuded gorgeous seafood essence in every spoonful. Traces of fatt choi ran through the soup along with sweet crab meat, strands of prized fish maw and vegetarian fins. It’s a soup to be enjoyed slowly for its depth of flavours. Perhaps Chef Lam knows best in terms of comfort classic flavours. His creation of Steamed Wild Caught Giant Grouper Slice with Congee, Fried Ginger and Tou Chu Chili Sauce had diners reminiscing about soothing flavours of delicate poached giant group slices in silky and smooth congee. A generous sauce of moreish and nutty bean paste and chili along with thinly julienned ginger and fresh herbs boosted the flavour of the fish and congee. Another unusual creation, the Braised Abalone Cubes with Sea Cucumber, Pumpkin Sauce and Crispy Smoked Meat featured prized abalones and sea cucumber smothered in creamy golden pumpkin sauce. The presentation was albeit a plate of mess but the flavours are really sublime once you tasted it. The abalone and sea cucumber cooked well and the sauce had a beautiful umami note that goes very well with the seafood. The sprinkling of minced smoked meat added a touch of smoky and sweet note to finish the dish. The Batter Fried Crispy Chicken with Yellow Curry Sauce is best savored hot for the full flavours and textures. Crispy and juicy boneless chicken coated in a creamy unctuous curry sauce would please even the discerning diners. Sliced lady fingers and chilis added touches of unusual textures to the dish. For touches of healthy note, Chef Lam is serving up a Ten Grain rice stuffed with Chicken Floss. The rice has an al dente texture from the mix of ten grains and is nicely jazzed up with seaweed, crispy chicken floss and a drizzled of creamy sauce. Definitely unusual but it made a nice change from the usual glutinous rice or preserved waxed meat rice. Dessert was Coconut Jelly and Nian Gao Roll with Cheddar Cheese, Musang King Durian and Macadamia Nuts. The odd thought of pairing nian gao with cheese and durian turned out to be a decent creative dessert from the approvals of the many diners there that evening. On the other hand, the coconut jelly with wolfberry sauce had a lovely sweet and fresh ending. The festive set menu was definitely unusual from the standard but had a pleasing comfort flavours that will leave diners a sense of what festive season from yesteryears are all about. Chef Lam and the culinary team has really outdone their sense of creativity and effort so make sure to check out Chynna menu. Yee Sang 20% discount, not available for take-away.